I actually keep secrets very well. I think partly because I have a strong disinterest in spreading gossip. However, there was a time in my 20’s when I could not. Being in your 20’s is a dramatic time of life. Things seem so much more important than they really are. Every decision seems like it will be life altering. Yes, a dramatic time. Because of this we tend to get tangled up in the affairs of others more than we normally might be inclined to. As I am a very private person I tend not to interfere with the affairs of others and really now I quite understand why. It is a messy, messy ordeal. When I was younger my friend was strongly interested in my boyfriends brother. Here is the thing. I knew that said brother had a pregnant fiance. The fact he was leading my friend on rather devalued my opinion of him to be honest. And my opinion of him was rather low as it was. My boyfriend knew his brother’s fiance well. Liked her. Was good friends with her. When my friend and his brother started ‘fooling’ around he was not pleased with the situation. There was loyalty to his brother and yet loyalty to his friend, the fiance. So what happened was that we both spilled the beans as it were. He told the fiance about my friend and his brothers actions. I told my friend about the existence of the pregnant fiance. Drama ensued. You see his brother wanted both of these relationships. He struggled then to keep both of them. He managed to convince my friend he was on the outs with the pregnant fiance. By then he certainly was, but kept trying to mend it. But mend it behind my friend’s back of course. In the end my friend also got pregnant. He also cheated on her. I again told her. She did not believe me. Of course we were not friends at that point due to the extent of the lies the brother managed to say about us. In the end he broke up with her and moved across the country where he sees neither of his children nor pays child support. As you can imagine I do not think fondly of the brother’s choices at that time but he had alcohol abuse issues. I had believed revealing these secrets would resolve the situation. Would point out how untrustworthy he was, as he was very untrustworthy in many ways. However, I was told many years later that one should never tell this sort of secret. That it is better if it is sorted out by itself. It seems so in this situation since nothing we had said changed anything. Neither party saw my boyfriend’s brother differently. All it did was create a lot of drama. I question if it was the right course of action, yet at the same time how could I not? Who wants someone they call a friend to be hurt? For example, I have been cheated on and told by the man himself. This is the best way to find out. You know directly and often you can determine the exact reason. The second man to cheat on me I found out from someone else and I did really appreciate this. While I suspected and I no evidence and having her present me with verification helped me get that evidence. Once I did, I could do something about it. Confront him with proof so that we could a) break up b) work through it. This is because no woman would want to accuse a man based on a gut feeling. While often they are right we feel at the same time we might be over reacting or overly jealous. So we need some sort of verification or evidence to act on it. Yet I have been told it is best to stay out of these situations. 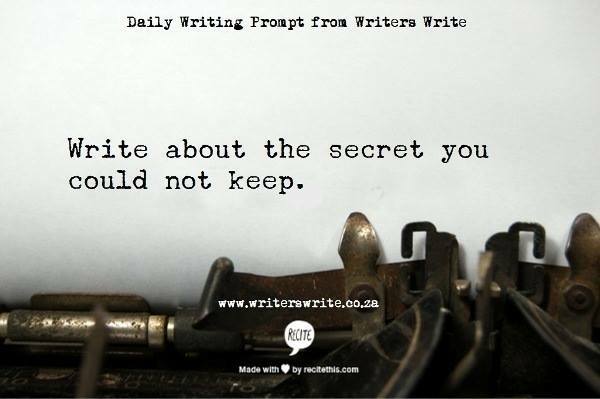 In my case, it is not a secret I would want people to hold. I would not want to be in that relationship not knowing and never resolve the problem. To me that would be horrible. To think of all the time you would waste. So it was not a secret I could hold. If it was a good friend I am not sure it is a secret that I could hold because it is not one I would like held in my case. A secret that could harm someone you care about should not be held I think. Previous postWhat do you to that gets in the way of your writing? Next postPrompt: When he walked into the cafe….